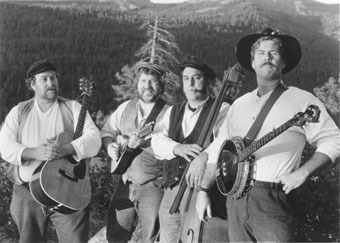 The Ballad of John Muir is one of 15 original songs about the people, places, and music of California featured on the Black Irish Band album California Story. It is performed in an up-beat style, inspiring us to think "John Muir's out there, if only we believe." It all started over 10 years ago when both Patrick Michael Karnahan and Richard Restive met on the set of University's Back to the Future 3. Both were used in the film as part of the Hill Valley Band. During the many film breaks they both talked about their love for folk music and Spanish brass. The Black Irish Band was formed, the name coming from the Spanish Sailor's love for the Irish. Karnahan coming from a strong Irish background and Restive being first generation Sicilian made for an interesting mix that woujld become the band's trademark sound of the future. And it all started with Back to the Future! To date the band has recorded eight albums. The latest release, California Story, has become a hit with history buffs and those that like story songs. Patrick Michael Karnahan, an award winning ASCAP songwriter, has writtten 15 original songs baout the people, places and history of California. In his music he has created a new doorway into understanding the history and times of the American West. Fellow mand bmembers Richard Restive and Ken Darby, of English backgrround, join Jarnahan in writing songs for their 7th album, Hooligans United. For a bunch of working guys the Black Irish have done a lot of touring far from the Siera Nevada Mountains they call home. If the band can not make it to a location their music will be carried over the airwaves. In 1998 the band performed twice on the internal radio program West Coast Live! They have been seen on CBS 's This Morning as well as other network news shows. The Black Irish have just returned from their 1998 Gold Rush Tour. On tour they were part of Canada's and Alaska'a centennial Gold Rush Celebration in the Yukon. Montana and UTalh has also become a new hotbed for the Black Irish, with sold out concerts and standing ovations. Call (209) 532-8375 or go to the Black Irish Band website at www.blackirish.com .